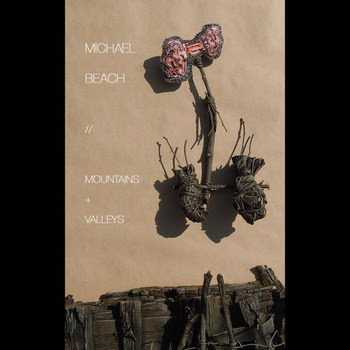 Displaced Aussie Michael Beach had a nice little 7" out at the dawn of the year, A Horse (have a read and listen here). I really liked it. 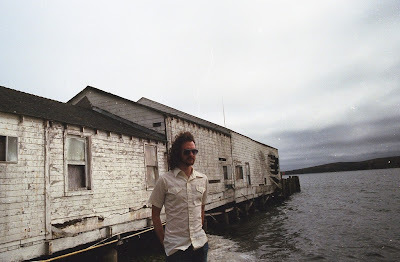 Well, he is releasing a mini-album to coincide with his forthcoming US tour, and it's the best thing he's done yet. Mountains + Valleys (through Spectacular Commodity and Twin Lakes) is a ballsy and accomplished collection of rustic rust, and it sounds amazing. This could do with the people he has roped in to help out - drummer Utrillo Kushner (Comets On Fire), Raymond Raposa (Castanets) on guitar and vocals, and Trans Am’s Phil Manley on the desk (Wooden Shjips and Barn Owl have enlisted his services in the past), Mountains + Valleys traverses darker terrain with more bluster than before, and is all the better because of it. There are only 100 copies of these suckers (possibly much, much less), so try grab one here. Otherwise head here to get the digital. Its fantastic stuff. Reminds me of Jim Ward's or Jason Molina's solo stuff, but with Sonic Youth tracks occasionally coming across the radio wavelength. Really great stuff.